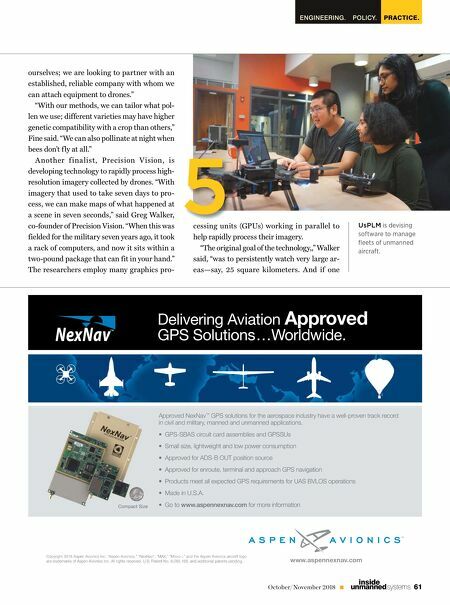 AIR ENTREPRENEURING 60 October/November 2018 unmanned systems inside the space they devote to parking. "During development and redevelopment of urban environments, cities assign space to parking based on projected demand, and this amount of space is usually not optimized," said Javad Roostaei, Quantif ly's civil and environmental engineering project manager. "Gathering data on parking is really time consuming and la- bor intensive, consisting of people manually counting cars on foot in all seasons with a pad and pen. These kind of studies can have a lot of impact—these spaces are usually in down- town areas, and whether or not these space are utilized can have huge effects on real estate investments." "We seek to optimize and automate the whole process of parking studies," Roostaei said. "We work with aerial images we collect by drone to monitor how parking areas are uti- lized over the course of a study." Coming in at third was TruWeather Solutions, which aims to provide better weather forecasts specifically for drones. "If you look out the window, you might see a sunny day and think it is a good day for f ly- ing, but if you saw, say, the wind push some branches, you would know that maybe winds at f light level might be severe operational hazards," said Jason Anderson, lead fore- caster for TruWeather. "TruWeather aims to solve the weather problem for UAS by provid- ing precise micro-scale weather data fit for UAS purposes." "For instance, let's say Amazon or FedEx wants to deliver a package by drone," Anderson said. Current government and private weather services typically provide weather intelligence on a 3-kilometer scale, which is not detailed enough for use for drones. "We currently have a 1-kilometer model over Syracuse, keeping track of winds, temperature and precipitation that can affect battery life and successful op- erations, and we hope to get down to 100 me- ters by the first of January, the kind of urban scales that Amazon would be interested in for delivering a package in Manhattan." TruWeather aims to gather weather data from drones, traffic cameras, county weather stations and other sources. "When weather is a factor, we think we can give 40 percent more f lying time," Anderson said. "Drones can f ly longer and safer, leading to more productivity and efficiency." POLLEN, IMAGING AND DRONE FLEETS Among the other finalists was Dropcopter, which seeks to help farmers use drones to pol- linate orchards. The recent alarming declines of bee populations has raised the price of insect pollination significantly, creating a compel- ling market for automated pollination via un- manned aircraft, said Adam Fine, co-founder and chief technology officer of Dropcopter. "We are the first company to move out of the theoretical aspects of drone pollination toward industrial-scale applications," he said. For the past five years, Dropcopter has ex- perimented with pollinating almonds, pista- chios, cherries and apples. "Our own studies suggest that we can boost the number of f low- ers that turn to fruits or nuts by 15 percent," Fine said. "With Genius NY, we can not only go to third-party studies to help validate our claims, but also bring our product from the pre-production phase to tried and true produc- tion models. We don't want to build the aircraft Photos courtesy of Genius NY and Bonnie Kittle via Unsplash. 4 the space they devote to parking. "During development and redevelopment of urban environments, cities assign space to parking based on projected demand, and this amount of space is usually not optimized," said Javad Roostaei, Quantif ly's civil and environmental Dropcopter helps farmers address the declining population of bees by using drones to pollinate orchards. They can even tailor the pollen used to help boost the number of fl owers that produce fruit or nuts.